Are smokers more or less happy than their non-smoking peers? Does being happy influence people’s likelihood of smoking? A wealth of research investigating the relationship between reported levels of happiness and smoking habits has unearthed some interesting findings. Turns out folks who smoke tend to be less happy than their smoke-free counterparts. But whether it’s the smoking that causes people to become unhappy or if people who are already unhappy are more likely to reach for a cigarette isn’t entirely clear. How Does Nicotine Affect Mood? Nicotine is known to briefly elevate mood. When smokers inhale or otherwise ingest nicotine and tobacco products, the brain’s endogenous (internal) opioid system is triggered, leading to an increase in “feel-good” neurochemicals called endorphins and enkephalins. However, this increase is thought to only occur in certain areas of the brain. One study showed that this upregulation of endorphins transpired in a region called the anterior cingulate, known to be involved in integrating emotions and memories. That same study found that smoking reduced endogenous opioid activity within a smoker’s amygdala, thalamus, and nuclei accumbens (brain regions associated with emotion, specifically the fear response; the regulation of sleep, consciousness, and sensorimotor activity; and one’s sense of reward and motivation, respectively) while increasing dopamine in these areas. Given dopamine’s association with reward and craving, researchers believe that its uptick correlates with quelling craving initially but increasing the need for more nicotine once that dopamine surge subsides. It is thought that this mechanism leads smokers to pick up more and more cigarettes as their day progresses—their brains want to maintain that feeling of satisfaction or relief. In this way, nicotine hijacks the reward and feel-good system of the brain, leading to a dysregulation of mood (overall state of mind) and affect (moment-to-moment feelings). This can drag down subjective well-being and cause individuals to feel and report being less happy, at least compared to folks who go without nicotine. Which Comes First: Unhappiness or Smoking? The data is clear: happiness can decrease once people take up smoking. However, low happiness scores are not attributable to smoking alone. In fact, many people may take up smoking as a response to (or an attempt to cope with) feelings of unhappiness that are already present. Unhappiness may be a risk factor for smoking. In the United Kingdom, smoking rates among people with depression are twice as high compared to smoking rates among people who do not struggle with depression. People who struggle with high levels of anxiety are also more likely to smoke. Smoking may thus be an outlet or coping mechanism for people experiencing chronic challenges with mood and affect—albeit one that also increases symptoms of these issues due to the chemical changes that occur with addiction as well as the effects of nicotine and other toxins cigarettes contain. One study conducted by Ataeiasl et al. 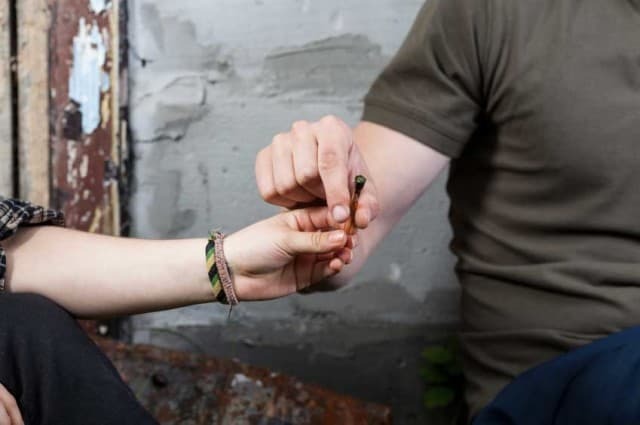 among high school students found that teens who were happier tended to be less inclined to smoke while those who were less happy were more likely to smoke. In a study of 1,161 10th-grade students in Iran, where the smoking rates among adolescents have been estimated to be as high as 17%, the more students smoked, the lower their scores were on a measure of happiness. This corroborated prior findings that adolescents who endorsed smoking within the past 6 months reported lower happiness levels compared to their smoke-free peers. But the question remains: Which comes first, unhappiness or smoking? The most informed answer may be that it’s impossible to tell for sure. But people who are unhappy appear to be inclined to smoke, and taking up smoking can—and often does—exacerbate unhappiness. Not to mention that smoking can contribute to a range of health concerns, including cancer, stroke, heart disease, and diabetes—to name only a few. People who smoke may be less happy to begin with—a result of genetic predisposition or environmental factors like diet, poverty, social discrimination, or living in an area with high crime rates. That unhappiness may prompt them to reach for a pick-me-up. Cigarettes are a stimulant, and they provide a temporary feeling of satisfaction—not to mention that in many situations they can provide a sense of community (cigarettes can be a means of socializing) and breaks from otherwise stressful situations (smoke breaks can be some people’s only opportunity to take five and, ironically, “breathe”). People who are less happy may be less likely to take good care of their health. Therefore, concerns about the extremely negative effects of smoking may be less deterring to these individuals. People who are less happy may be more susceptible to peer pressure, which holds a greater appeal in its promise to alleviate emotional suffering. Often times, peer pressure can inspire unhealthy activities like smoking. Hence the higher rates of smoking among the less happy. People who are less happy may be more susceptible to addictive behaviors. They seek out activities or behaviors that boost their mood and cling more stringently to those that promise a fix, even when those activities or behaviors (e.g., smoking) ultimately harm their health. Lastly, smoking may worsen mood, exacerbate conditions like depression and anxiety, and perpetuate unhappiness, thereby increasing susceptibility to all of the factors above. Men are more likely than women to smoke—nearly 17.5% of adult men in America smoke on a daily basis, compared to 13.5% of adult women. Among different ethnic groups, individuals who identify as American Indian or Alaska Native have the highest rate of smoking (31.8%) while individuals who identify as Asian have the lowest rate (9%). Individuals with disabilities (21.2%), including mental illness (32%), as well as individuals who identify as LGBTQ-IA+ (20.5%), are more likely to smoke. A 2018 study also found that being obese was linked to an increased risk of heavy smoking. People who quit smoking report increases in happiness. According to one study, ex-smokers’ happiness levels were on par with that of nonsmokers after a year or more of quitting. “Whilst these results are cross-sectional and have to be interpreted with caution, this adds to the evidence that smoking may decrease happiness and stopping may increase it,” the researchers concluded. Today there are more resources for smokers looking to quit than ever before. 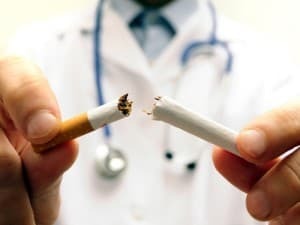 If you or a loved one is interested in learning more, consider reaching out to your doctor to discuss some immediate and long-term strategies to get and stay smoke-free—and potentially increase your happiness as a result.